Quickly access Files, Folders, and Websites. Is there a better alternative to QuickMenu? 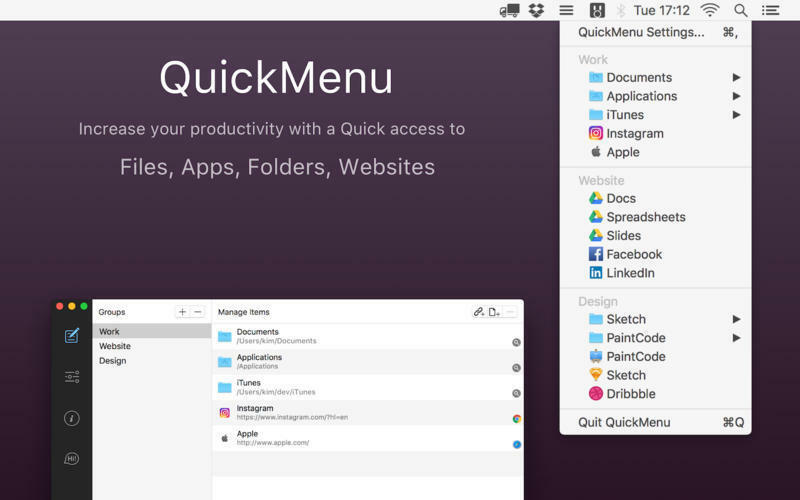 Is QuickMenu really the best app in File Management category? Will QuickMenu work good on macOS 10.13.4? 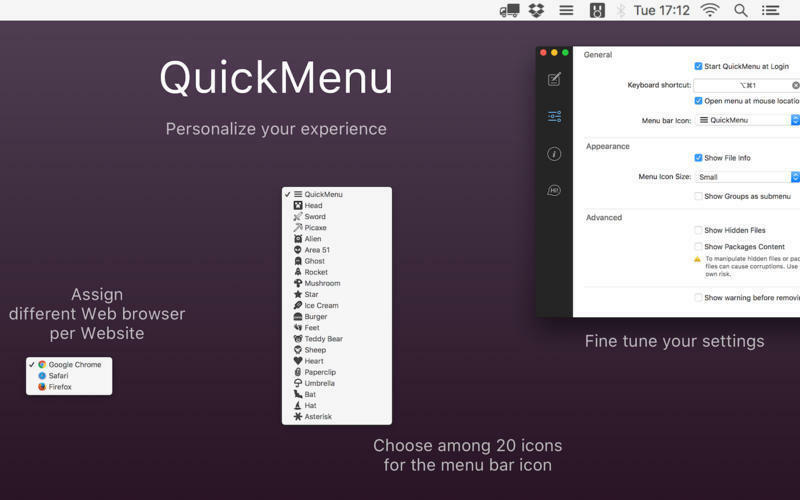 QuickMenu is a convenient app that lets you build your own menu bar menu to access quickly files, folders, apps and websites. Add as many files, folders, websites and apps that you would like to access quickly. Sort files, folders, websites into Groups with headings or submenu, making it easier to find the item you’re looking for. Hotkey to show QuickMenu at mouse location. Personalise the web browsers per website. Quick access in full-screen or SplitView. Choose whether the app starts at login or not. Choose the app that will process a folder or open a file. Convenient, for example if you want to process a photos folder quickly. QuickMenu needs a review. Be the first to review this app and get the discussion started! QuickMenu needs a rating. Be the first to rate this app and get the discussion started! Files, folders, websites are presented with their respective icon. Choose among 20 icons to personalise your menu bar icon. Add files, folders, websites, apps with drag and drop or files picker. Groups re-ordering could in rare cases lead to a buggy state. Problem fixed.